Whether you are the parent of a child with cancer or a patient yourself, you are facing the anxiety that comes with a cancer diagnosis. One concern you may have is how you will manage your finances throughout and beyond treatment. 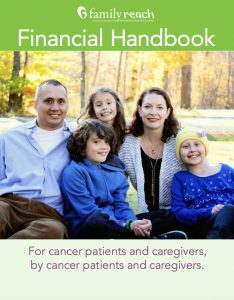 At Family Reach, we have been helping families manage the financial burden that accompanies cancer for the past twenty years. We know that you did not ask for this burden, and that you’re likely feeling unprepared for what’s next – and that’s why we created this Financial Handbook. Inside, you can expect to learn about potential financial challenges, how to identify roadblocks and where and how to seek financial support. We will also share some tips and tricks from the patients and caregivers who have received support from Family Reach. By reading this guide, you should feel prepared for what’s ahead and empowered to advocate for your family’s financial health. If you are a patient or family looking for assistance, please have your hospital social worker contact Family Reach directly to determine eligibility. Learn more about Family Eligibility. To download your free copy, register below and click submit. At which Hospital / Cancer Center are you receiving treatment? How did you hear about Family Reach?